Keeping the Pounds Off! 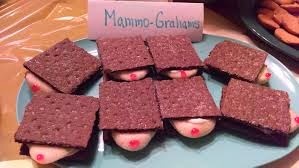 : Mammo Grahams? October is save the Ta-Tas month. October 29th is my appointment for a mammogram. Since the date is so close to Halloween, I wanted to make these and bring them into the imaging office. The photo was sent to me by a friend who got it off the Internet. I have not made them. I have to balance my desire to make something fun and creative with my known past behavior to put sugary things in my mouth that do not belong there. I desire food sobriety and sanity more than I desire making these particular treats. I will come up with something else - something non-edible. I don't publish anonymous comments. If you would like to identify yourself I will post your comment. I remember how painful mammograms were when I was obese - another benefit of losing weight! - and the sight of those cookies made me wince. So now you have two reasons not to bake them!